Tianjin Binhai International Airport (IATA: TSN, ICAO: ZBTJ) (simplified Chinese: 天津滨海国际机场; pinyin: Tiānjīn Guójì Jīchǎng) is an airport located east of Tianjin, in Dongli District. It is one of the major air cargo centers in the People's Republic of China. 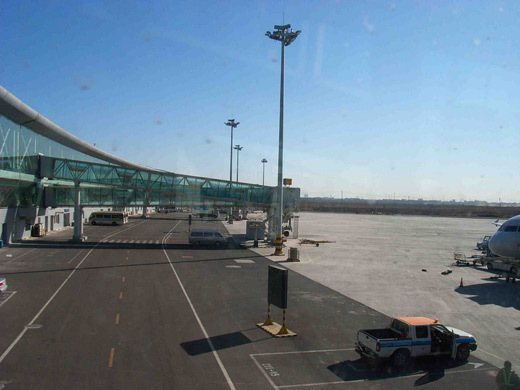 It is the hub airport for the newly established Tianjin Airlines, and privately owned Okay Airways. It's also a focus city for Air China. International flights are primarily operated by Korean Air and Asiana Airlines to Seoul-Incheon International Airport, All Nippon Airways and Japan Airlines to Nagoya-Chubu Centrair International Airport. Construction of a new terminal began in August 2005 and was completed by the end of 2007 scheduled to be in full operation by 2008. The airport expansion will provide a state-of-the-art terminal building, which is more than three times bigger than the current one at 116,000 m. When the three construction phases are complete the airport terminal will be over 500,000 m and be able to handle 40 million passengers a year. Over the period of the project the airport site will enlarge from the current 25 km² to 80 km². The airport as a whole will resemble Amsterdam's Schiphol airport in size and will be able to handle over 500,000 tons of cargo and 200,000 flights a year. The expansion, with a total investment of nearly 3 billion yuan (409.5 million U.S. dollars), started in August 2005. The runway was also widened to 75 meters from the current 50 meters and lengthened 400 meters to 3,600 meters. In May 2009, the airport has also completed the construction of a second runway, and the expected number of passengers will exceed ten million. In 2008, the airport handled 166,558 tonnes of freight, and became the 11th busiest airport in China. Tianjin Airport is also among the fastest-growing airports in China, registering a 20.2% increase by passenger traffic and a 33.2% increase in terms of cargo traffic in 2008. MISC Flt alt within area of N39 09' E117 14' to N39 16' E117 14' to N39 18' E117 22' to N39 13' E117 27.5' to begin is rstd to at or blw 2600' unless otherwise req.